This listing is for a 7 day Road Opener, also known as an "Abre Camino" service. 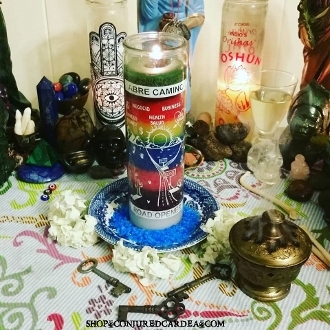 This service utilizes a 7 color, 7 day vigil candle dressed with my authentic Abre' Camino oil. This is a set oil created from fresh abre' camino plant which I have personally dried and prepared for this oil to lend it true, opening energy. This service can be used for matters of health, business, love , money or any issues that needs some room to let good fortune in. If you feel stuck in the same place in your life, that little positive change is happening or that you're not succeeding in certain areas, a Road Opener service can help. Past experiences, blockages, lack of motivation or simply slow moving energy towards your goal, can "bottle neck" your life making success and growth slow to a hault. This service seeks to expand the avenues that lay ahead of you. My goal is to help you reach your goals through spiritual motivation, giving you a jump start on your path. This service helps to open up that bottle neck into a large, open path with free flowing good fortune and ashe focused directly towards your goal. Let me help you open up your paths to prosperity, opportunity, spiritual growth and success. You will receive an emailed report and up to 5 photos of your service. **Note that there is no one treatment or therapy that will be successful for every person. Please read my testimonial link above for feedback on my work.